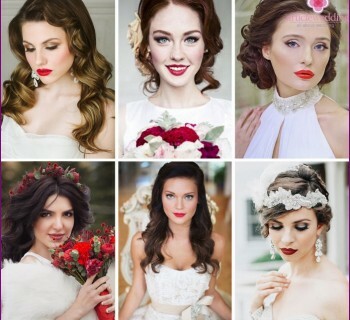 On the wedding day bride wants to beroyally beautiful, bright and original. In this case always chosen the best dress, hair, makeup and jewelry. Wedding fashion trend of recent years - the decoration bride's body a variety of drawings, making a spectacular image of the bride and unusual. Wedding body painting - a decoration patterns décolleté, arms, back and legs, even the girls. Let's look at how to apply the avant-garde pattern on the body and how long it lasts. Cautious girls do a little painting anda bold dare to surrender into the hands of the master, and decorate bodypainting significant portion of the body, allowing the artist to express creative imagination to the fullest. Many brides make the painting closed areas and bikini area, which only the husband can see. This body art must surprise the groom on their wedding night original visibility fishnet stockings, lingerie and lace garters. The ancient people did in the Stone Age paintingon the face, which, along with the tattoo, stressed a person's status in the tribe. 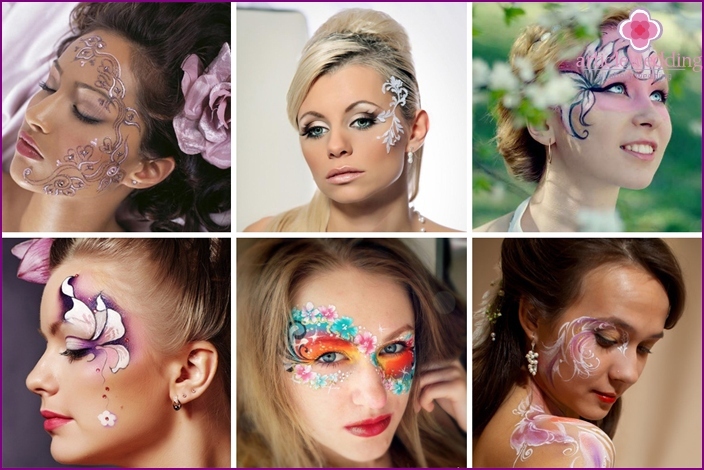 Modern body painting has long been stepped into the life of ordinary people, very often they are the bride. Who make up the bride does not have to give the natural elements, on the contrary, each girl trying to stand on their wedding day. On the face of the bride are small masterpieces in the form of floral ornament, descending from the upper eyelid on the cheeks or transmitted only on the temple with one hand. 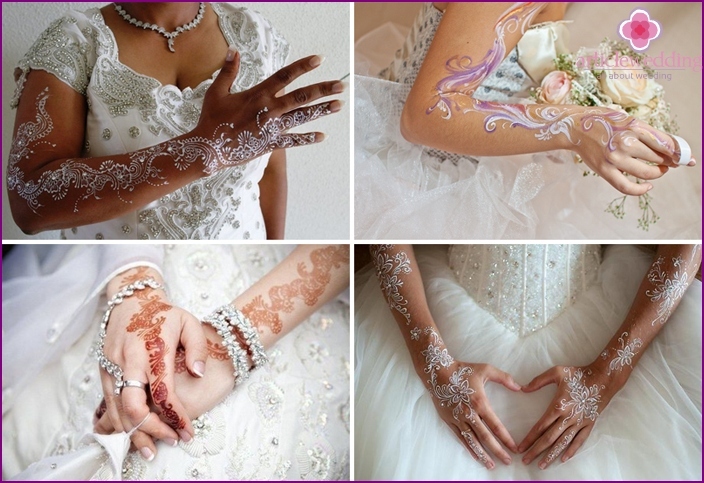 Draw snow-white or silvery temporarytattoo for bride can be anywhere on the body, to which she would like to draw attention. It can be a delicate garter around the legs or a nice bracelet, ovivayuschy ankle, but most brides prefer to draw fishnet gloves. This trend came to us from the Indian wedding traditions, during which the hands and feet decorated with future wife ornate henna patterns. In India it is believed than exquisite pattern, the stronger the love of the newlyweds. It looks nice on the skin of the bridemulticolor painted as a necklace, made by a professional craftsman. This completely replaces bodypainting accessories and looks stunning. Wedding necklace made paints, draws attention to the neck area and emphasizes the elegance of the neck, giving the bold image of the bride a little shocking. Romantic bride and groom graceful tattoo suit,continuing lace or embroidery on a wedding dress. Beautifully interwoven lace straps create, as a rule, with the white paint with pearlescent, supplementing them with rhinestones, or pripudrivaya silver or gold powder. At the request of the girl lace ornaments adorn the open back wedding dress, sleeves and neck area. Figure is located on the shoulder or hand, he emphasizes the elegance of the bride and lace applied paint not everyone will be able to distinguish it from the present. Wedding painting on the body does not cause anyinconvenience and absolutely safe. By applying the technique of body painting is divided into manual techniques and airbrushing. In the first case the wizard is used for applying a pattern brush, while airbrushing - special paint sprayer with automatic air supply. All images are of a temporary nature. Materials for applying body art - it akvagrim pencil on a body, paint or henna. The longest keeps the skin natural henna (2-3 weeks), but it is presented only brown and red hues. For the wedding the bride and groom often chosen applicationOrnaments with white paint or pastel colors: purple, emerald green, pale blue, peach, pink, silver. To use the face painting akvagrim that gives bright saturated colors. All these colors do not irritate the skin, does not cause allergic reactions, and the painting technique itself is not such a difficult thing, as it might seem at first glance. Wedding bio tattoos (mehndi) is applied to the bodyBride using henna. Body painting is drawn so quickly - an experienced master will create an image of any complexity in just 1-2 hours. Do mehndi special brush, and the procedure is completely painless and hygienic. In its execution it is impossible to damage the skin and bring an infection. Natural henna has a beneficial effect on the skin, healing some diseases. After the application it dries for about two hours, after which the day drawing can not be wetted with water. The artist applied manually or through a stencil image of a latex adhesive. With a brush put drawing is filled with multicolored or self-colored glitter (glitter, powdered pigments). After a couple of minutes the glue dries, the excess glitter and easily cleaned. On the wedding day the bride in the form it shouldbe harmoniously, so when applied to body art should not forget about the main rule: in all sense of proportion should be followed. When you create an exquisite wedding image is necessary to consider all the details: the color and style of dress, make up the bouquet the bride, make-up, hairstyle and accessories. On this basis, a professional will certainly find the perfect shade for the drawing. Perhaps some of the flowers on the dress or in a bouquet will be the dominant story for the original body art. Look at the following examples of such work.